MTools Ultimate Excel Plug-In - MTools fills the gaps in Excel - for you! 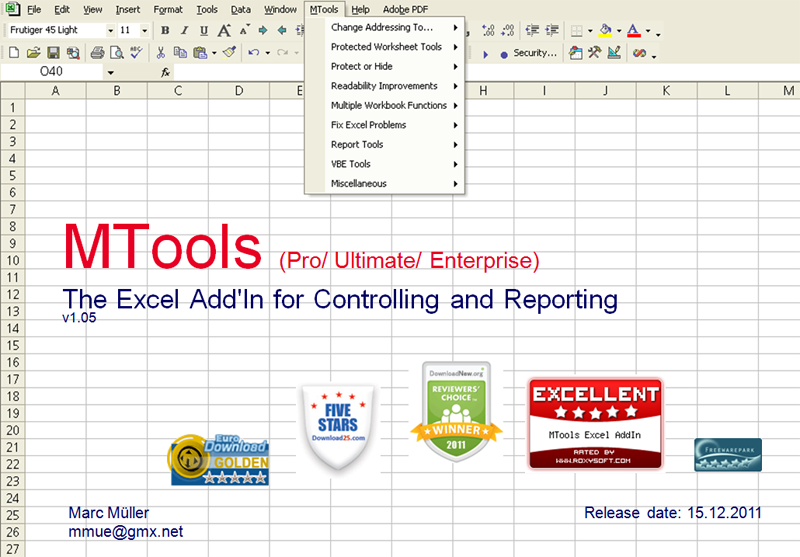 The Excel AddIn MTools Ultimate is the essential software, that significantly enhances the capabilities of Excel. It provides the users with a broad and carefully selected collection of time-saving tools. Even Excel novices will notice, that this plug-in helps them developing their excel reports (spreadsheets) significantly faster and more reliable than many excel experts - doing the same without this add-in. Use MTools and impress your boss with the speed and the reliability of your work or enjoy your newly gained free time by finishing your job faster than expected (by your boss). You can trust me! I know what I'm talking about. I work in a Controlling department of an international company and my job is to develop all kind of excel reports and I don't know anybody around me who can do it faster or more reliable than me. You will notice, that I do not offer tools for 'everything', because I know that too many functions confuse the users more than they could help. Therefore I concentrate on those tools, that - by my experience - offer the highest benefit. I invite you to download a free, timely unlimited & unrestricted trial edition. New in Version 1.04: Protect multiple workbooks with a 128 Bit RC4 encryption Key Benefits of the Ultimate Edition: - Free Lifetime Updates - Additional Functions MTools leverages your work with over 40 unique utilities that cover the following main areas: - Handling of multiple excel files for specific tasks - Password Remover - Data Analysis - Report Development - Reporting - Name Management - Link Management - Management of cells in protected sheets (e.g. copy data in unlocked cells of protected sheets) - Excel bug fixes (e.g. Save uncalculated Workbook) - VBE Tools (e.g. Remove VBA Comments) The Software MTools is compatible with Excel 2002 or higher. It doesn't need any installation (registry entry,..) and will be delivered as a normal excel file (.xls) with the possibility to install it as an addin.